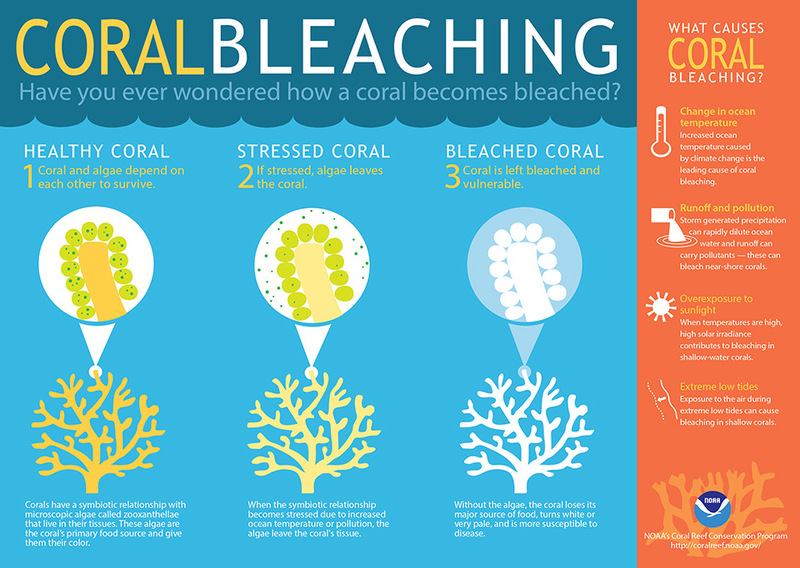 (Infographic credit: NOAA’s Coral Reef Conservation Program) Although corals can recover from mild bleaching, severe or long-term bleaching can be deadly. After corals die, reefs quickly degrade and the structures corals build erode. This provides less shoreline protection from storms and fewer habitats for fish and other marine life. News from NOAA indicates that the same record ocean temperatures that are causing widespread bleaching in Hawai`i are expanding into the Caribbean, threatening coral in Puerto Rico and the U.S. Virgin Islands. This has prompted them to issue a declaration of the third global coral bleaching event ever on record. This bleaching event began in the north Pacific in summer 2014 and expanded to the south Pacific in 2015. It is hitting the U.S. coral reefs especially hard: NOAA estimates that by the end of 2015, almost 95% of U.S. coral reefs will be exposed to ocean conditions that can cause corals to bleach. The biggest risk right now is to the Hawaiian Islands, where bleaching is intensifying and is expected to continue for at least another month. The Main Hawaiian Islands also saw bleaching in 2014, which was then only the second bleaching occurrence in the region’s history. During this time, parts of the remote Papahānaumokuākea Marine National Monument in the Northwestern Hawaiian Islands also saw devastating bleaching and coral death. The next concern is the further impact of the strong El Niño, which climate models indicates will cause bleaching in the Indian and southeastern Pacific Oceans after the new year. This may cause bleaching to spread globally again in 2016. For more information about PICCC’s project to predict the degradation of coral reefs due to climate change, click here.